Overall, I LOVE this coat! It's a soft, attractive, great layer piece. But the coat has a design issue that can work against its purpose, which I will explain below. An all-woman design team created this hybrid design — the coat has some really great features. This piece also strikes a nice middle ground of being tough enough to go play in, but it is attractive enough to be worn to the office. 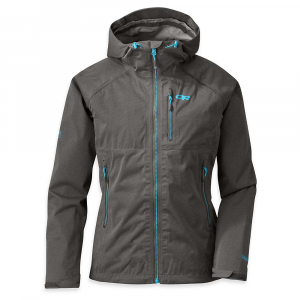 Designed specifically for women, by women, the Clairvoyant Jacket uses the same incredibly breathable, waterproof GORE-TEX Active technology of our Outside Magazine “Gear Of The Year” award-winning Men's Axiom Jacket. Streamlined, durable and functional, the Clairvoyant is built for high-alpine climbing epics and aerobic backcountry tours. 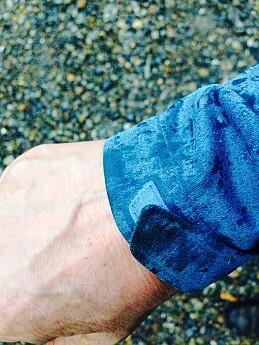 And unlike many waterproof shells, the polyester face fabric is soft, supple and quiet, yet easily repels unpleasant weather during all-out adventures. This test coat is a medium, and I liked how the shoulders were roomy, and the sleeves were actually a little long, which I really liked for layering. One 5'8" lady who has very long arms found that this coat accommodated her really well! However, even with my small/medium build, I am not a stick figure, and I found the hips to be a bit snug for layering. To make a minor improvement, I would like to see the hip hem have a little more give or flair in it. It has a cinch string, but the hem needs to give a little the other way, too. I believe that would add a little more versatility to the coat. Where I really desired this feature was in layering. The coat fitted fine with just a light layer or two, but when I added a down vest, since the hip hem was snug, the vest rode up inside the coat, and it made me feel like the Stay-Puf Marshmallow Man. 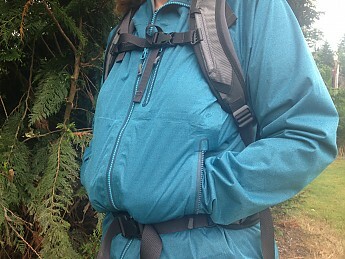 The jacket comes to just below my hips, so it rides well and keeps it from pulling up, and helps to keep light rain off of the backside “shelf.” Even while wearing a pack, this coat rides really well. I never felt bound-up with bunchy fabric. The design team scored big overall with the adjustable features. The cuffs are a hook and loop tab. I keep expecting them to scuff and curl like I have seen in other coats, but so far, I see no sign of wear. I LOVE THE HOOD! I like how I can cinch down the hood without a hat, and the brim keeps water out of my face, or I can relax the drawstring, and the hood will accommodate a helmet. As noted earlier, I would like to see a little more flex in the hips. I like the drawstring feature in the hips, and the clasp is effectively hidden in the hem, leaving a nice lie-line of fabric. This coat works best in light rain. I did not get to test it in the snow, but I would be VERY comfortable to take it as a shell on a snowshoe trip that had light snow in the forecast. But because it is made to wick, I found that it is NOT windproof. In fact, because it wicks so well, I found when wearing the coat alone in the rain could make me sort of cold as evaporation did its job to shuck rain, creating the by- product of dropping the temperature of the coat. 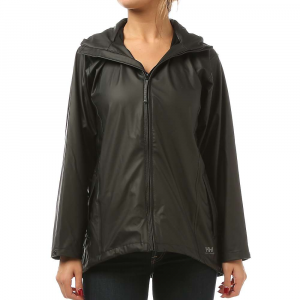 Now for the critique: This coat will wet out during fairly heavy rain. 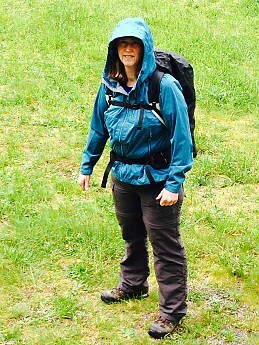 I wore this on a long weekend in the Olympic National Park while it rained very steady all afternoon. The tops of my shoulders and the hood wetted out after about four hours of steady rain. Worse, the hems of the wrists, and the hip hem leached water onto whatever they touched. Thus the weak link of this coat is how the high tech fabric automatically wicks onto the wrists and worst of all, into the wearers’ pants. I found that not only did my pants get wet just from the rainfall, the coat leached the water directly into my pant and underwear, literally soaking me from the hips down. At one point, I had water running down the inside of my pants, threatening to soak the inside of my boots. 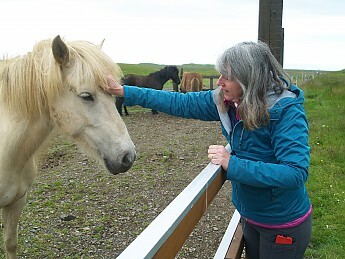 I also got very very wet while in Iceland during an absolute downpour. 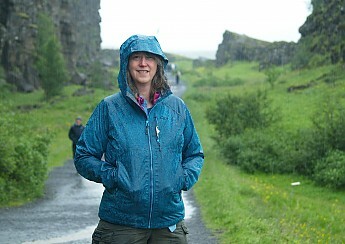 The coat did not wet out since I was not out long enough to soak through, but the rain DID drench my pants via wicking. Thus, this coat is exceptional at wicking. That is the feature that genuinely sets this piece apart from its competitors. In a light rain, this coat is an absolute workhorse! I took this coat out on a bike trip where I really wanted to test the breathability during a hard work out. 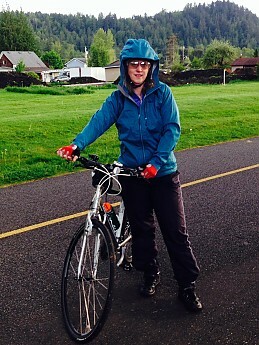 I intentionally kept the coat on as I warmed up during my ride. I found that the coat vented fine, and I didn’t get sweat-soaked from wearing the coat. I felt like it was exceptional breathability. I also liked how to keep weight down, the designers use the pockets as a way to help vent body heat. I really loved this coat as the external layer. 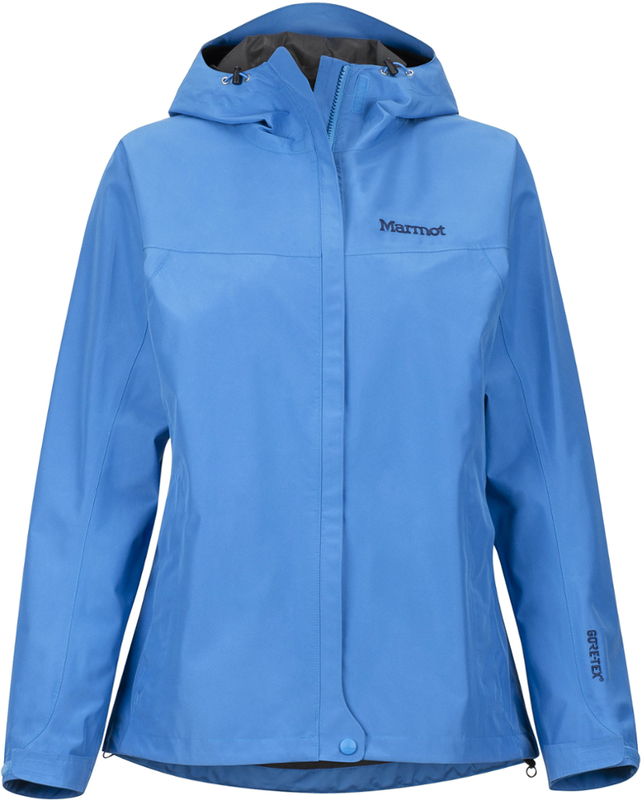 I just had to be aware that it really is not windproof, especially when wet, because of its wicking/evaporative design — the convective nature of the wicking made the coat feel cold at times as it dried. As noted earlier, I liked how the coat was *overall* designed to be a great outer layer. I felt comfortable layering under this piece, with the exception of the snug hip structure, but I figured out how to make that work. 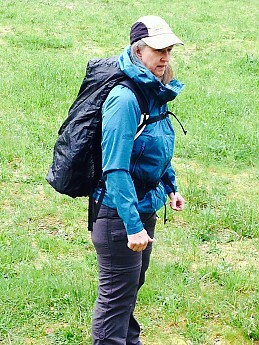 I have worn this coat quite a bit, including backpacking training, backpacking trips, horseback riding, touring, and travel. I don’t see any signs of wear. I have had to stuff, cram, and fold this coat, and the wrinkles caused by that treatment just fall out. The features are fantastic. Each feature is placed very intuitively. My hands automatically went to where these features made sense, and each feature was where it should have been, with each design being very easy to use. The hood and zipper components are also really well designed — neither my chin or cheeks rubbed at all against the fabric or zipper. I also have run this coat through just the rinse cycle in the washing machine. I had a big streak of horse dirt ground into the sleeve, and just a rinse took out the mess. Just clean water also helped to wash the smell of campfire out of the coat. Using and understanding this coat has a bit of a learning curve, but once the user sees the strengths and designs of this coat, it makes a terrific addition to the outer wear gear arsenal! 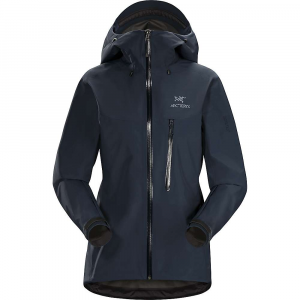 The hybrid, comfortable Goretex fabric combined with its well-thought-out design have created an overall terrific coat. 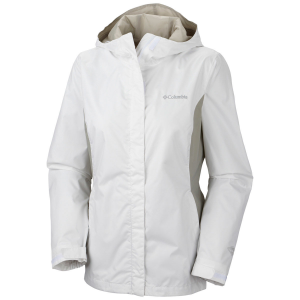 The coat also features a heavy-toothed zipper which makes usage smooth and sturdy. The brim of the hood also features a stiffener on the edge, which helps hold the hood up, and keeps rain off the face. OR continues to build on its reputation of making excellent gear. I am highly impressed with the quality and durability of this garment. 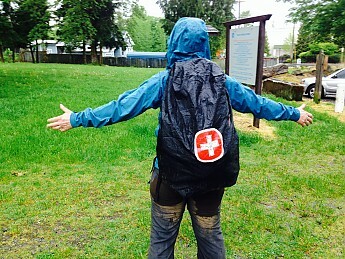 In the Pacific Northwest, we had a very wet spring, so I wore this consistently when out for training walks and hikes. It also went with me to Olympic National Park on a three-day wet weekend, and to Iceland, where it rains at least once a day 75% of the time. 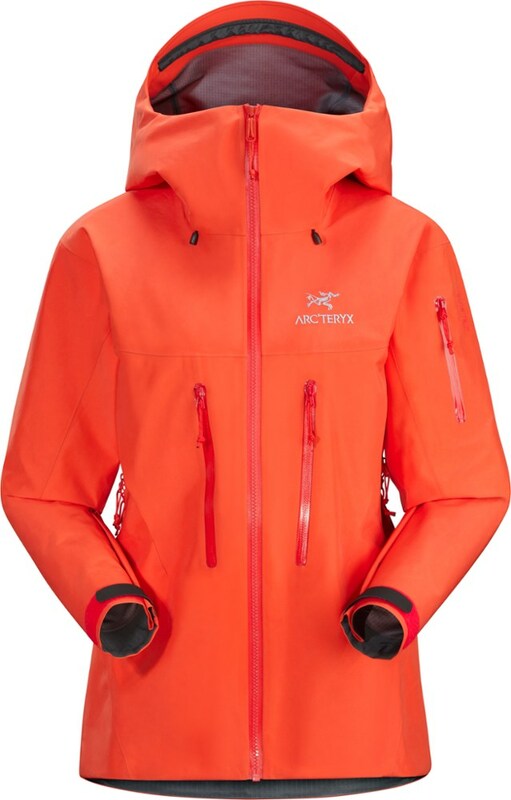 Even if I had not been testing this coat for Trailspace, I would be very serious in buying this coat. It suits my outdoor style very well. It's tough, attractive, and effective. Nice review, second gear! 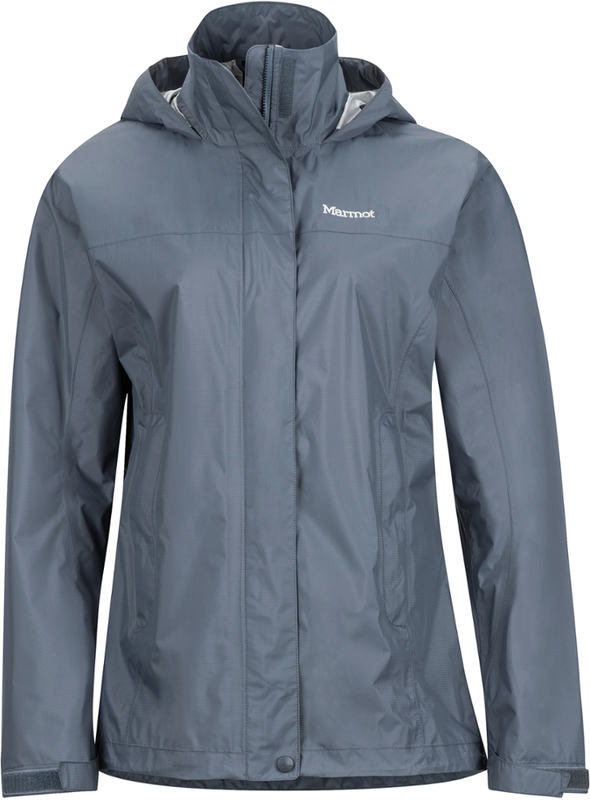 Thanks for testing out this OR jacket, and bringing it all the way to Iceland and back.